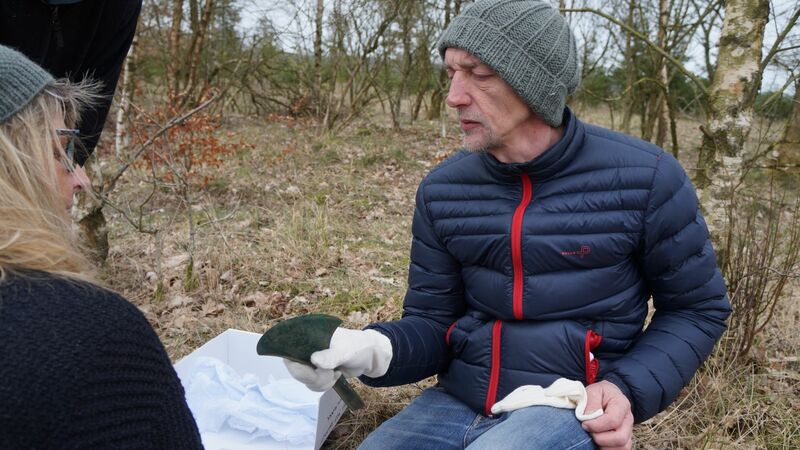 In a field at Boest in Central Jutland spectacular finds from the Early Bronze Age has recently been found. Thanks to a christmas tree producer that let his brother-in-law [an newly started amateur metal detector surveyor] search the area after he had cleared it. 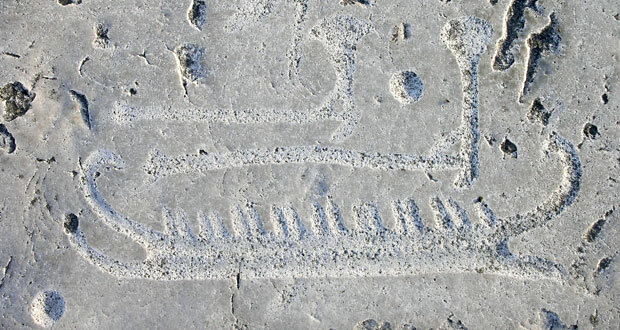 The dating says from 1800-1600 BC. [so the scholars think 1600 BC most likely]. 5 big bronze axes. Only 5 such big "randliste-økser" [German: Randleiste Axt, English: Flanged Axe] have been found from this period in all Northern Europe and now then 5 from the same depot. They are from 25-30 cm and weighs up to 1 kg [so probably ritual axes, though use in ritual combat should not be dismissed]. Two gold arm-rings, each 21 g, (so obviously a pair) and a gold finger-ring of 16 g.
Weapon finds so far now shows 9 bronze flanged axes ! [the 4 minor ones are between 15-20 cm] and one bronze spear-tip. 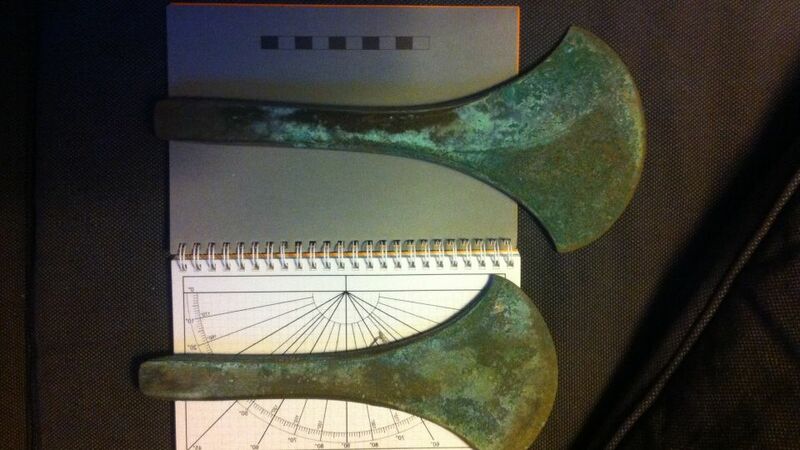 This article shows a picture of the 3 last bigger axes, that was found right under the two first found [not the smaller axes though the article says so]. The area also shows a procession road with 5 linear rows of man-height tall wooden poles, that can be followed for 100 meter. Depot 1 was found on the edge of the procession road and depot 2 was right across on the other edge of the road. Apparently he made this discovery on his 4th detection attempt [lucky guy]. An earlier find (possibly 1887?) from nearby Boest Mose (Bog) is at the National Museum. 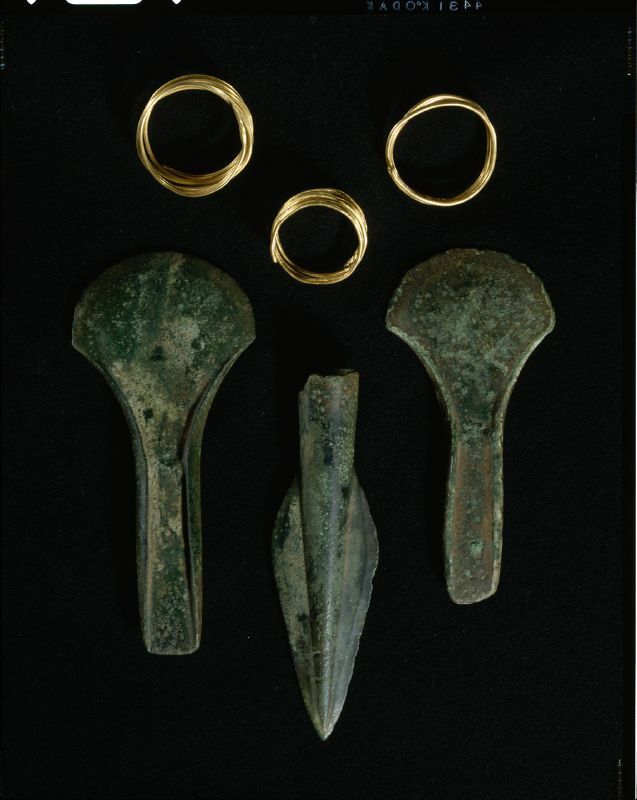 It comprises of two bronze axes, a bronze spear tip and three gold rings. The axes looks as being from the same period. Also from a 1943 digging a set of two fully preserved 12-spoked oak wheels and a partial axle were found at Boest Mose (couldn't find a picture). At first glance is does seem like a chariot so typical of the Bronze Ages. What I have found is that 12-spoked wheels possibly are more Hallstatt time period, which would indicate Late Bronze Age in Denmark (700-500 BC). Very cool axes. The more I see bronze age stuff, the more I like it. How were axes like this hafted? I imagine that a handle was partially split and they were bound to it using cord or leather...? And I think one very ancient technique (which I know that North American Indians used up into the early European colonization period) was to bind the head to the haft (or shafts for a spear or arrow) using wet rawhide or sinew. As the lacing dries, it shrinks, creating an incredibly tight binding. 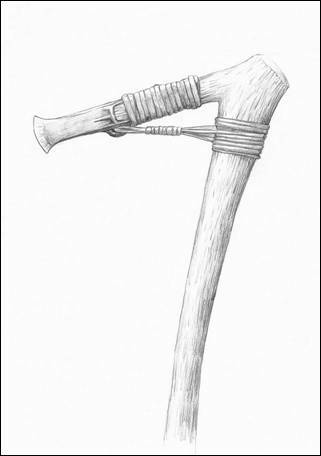 The early flanged axes as the ones found at Boest were perhaps a palstave set-up, which could be a continuation of the Danish Copper axes maybe done in the same way as Ötzi's copper axe. So the 1kg, 30 cm bronze axe must have taken some hefty 2-handed palstave to swing with. I would guess they took part in ritual processions or was used in religious duals. Thanks for the follow up about hafting... The "palstave" set up seems really weird to me. Wouldn't it be really breakable at the bend? I'm guessing that all depends on the wood quality and set-up. Since palstaves were around for a long time, they must have worked, but there was probably a lot of skill involved. Top axe looks like the Boest type with what looks like a palstave set-up, the other axe is a "Spoon-shaped Flanged Axe" also with a seemingly palstave set-up, which you also find in Denmark. The ship beneath them shows clearly, that the tradition behind the Hjortspring Early Iron Age war canoe is all the way back in the Bronze Age. Left row is images from Bronze Razors and right row from petroglyphs. So this image is clearly from the Early Bronze Age. I know this is a bit of a necropost, but I just stumbled across this thread while searching for something else. I like the aesthetic look of them and the context in which they were found is really interesting. So the axes were probably used in some kind of ritual procession along the road - then perhaps in some ritual combat - and finally deposited according to certain rules. Bronze age Denmark does seem to have had a thing for giant axes, lasting from the early bronze age up to the end of the bronze age. While you have to be really careful labeling anything ceremonial, at least for the late bronze age axes it is very obvious they were never intended to be used, such as the giant 7kg weighing axes or the later totally hollow cast blunt axes. N.b. one of such large flanged axes made it all the way down to the Netherlands. I doubt that this one is included in the 5 known examples. Thanks for showing the picture. 28 cm is pretty respectable. Interesting that its called a "Randbijl" in Dutch. 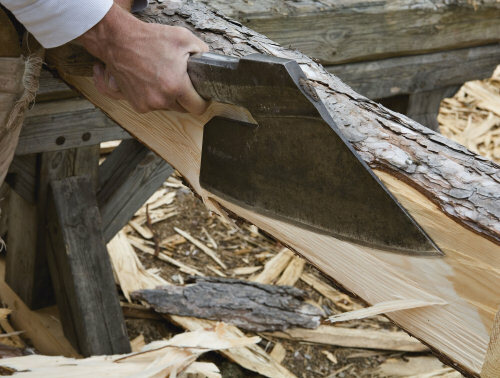 En bredbil in Danish (= Broad bil) is a special woodcarving axe, especially used for shipbuilding in the viking age. Use of bredbil by Nationalmuseet when fine cutting planks on a viking ship. Actually I don't know what 5 former finds they refer to. This example you give is probably the result of a gift exchange which seems very typical of the indo-european bronze age gift-exchange network. Maybe to secure alliances across trading networks, so you had security in passage based on the sacrality of guest friendship and gift exchange. I was also careful not to exclusively call the axes for ceremonial, but the really big ones found at Boest seems unlikely to have been used in massed battles (but then again who knows? ), but I certainly find it plausible they could have been used in duels, that often takes place within a highly ritualistic framework (whether it is judicial based and connected with sacrifices).